On Friday, October 21, 2016 in Grand Rapids, Michigan, 13 Japanese delegates comprising the 10th Georgetown University Leadership Program (GULP) received their graduation certificates. As political and media leaders in Japan, they were well suited to participate in the program, which provides an in-depth look at the American political system. This year’s cohort had the opportunity to hear from esteemed political leaders and scholars such as Secretary Norman Mineta, who served as Secretary of Commerce under President Bill Clinton and Secretary of Transportation under President George W. Bush. Other high-profile speakers include Professors Victor Cha, Michael Green, Sam Potolicchio and Mo Elleithee, executive director of Georgetown’s Institute of Politics and Public Service. While in Washington, delegates also spoke with officials from the State Department and Congressional staff and toured Capitol Hill. The informed international perspectives that the delegates brought with them elevated classroom discussions about democracy, the media, and presidential elections. A highlight to their experience was watching the third and final presidential debate between Secretary Hillary Clinton and Donald Trump at the SCS campus. Delegates then flew to Grand Rapids, an economically vibrant Midwestern city and home to Amway, one of the country’s largest privately held businesses and a co-sponsor of the GULP program. While in Grand Rapids, delegates spoke with Amway executives, including Chairman Steve Van Andel. They compared U.S. and Japanese regional development strategies with a panel of local business leaders; explored Grand Rapids’ “Medical Mile” hospital, medical education center, and research hub as a model for public-private partnerships; and capped their program with a discussion of common governance challenges with Mayor Rosalynn Bliss. “The Grand Rapids experience is part of the beauty of GULP. In addition to the component of the program at Georgetown in Washington, D.C., we were able to meet with corporate and political leaders in Grand Rapids, a small city with a population of 200,000, which allowed us to see the diversity of the U.S.,” explained the Honorable Yoshihiro Hayasaka, member of the Tokyo Metropolitan Assembly. The program, sponsored by Amway and the Japan Times, is an exemplar of cultural exchange and shows Georgetown’s deep commitment to engagement with Japan. The University has maintained particularly close ties with Japan throughout its history. In the mid-1930s, Georgetown hosted the first students on exchange from Sophia University in Tokyo. Today, the University has study abroad partnerships with five universities in Japan. In 2015, the Japanese government established an endowed chair in Modern and Contemporary Japanese Politics and Foreign Policy in Georgetown’s Asian Studies program, allowing students from the US and all over the world to take an in-depth look at Japanese policy. The GULP program is a preeminent international executive education program within the Georgetown Global Education Institute (GGEI), led by Assistant Dean Qi Chen. GGEI provides education, training, and mentoring to leaders and administrators from established and emerging economies. 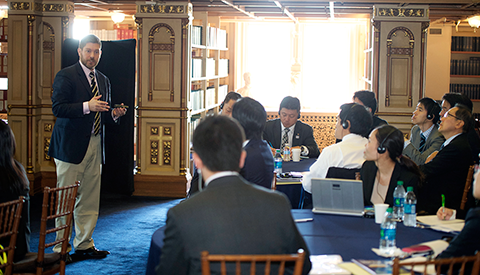 The Institute brings together leaders in a collaborative educational environment tailored for senior government officials and corporate executives from around the world, including China, Japan, India and Brazil. GGEI is an initiative of Georgetown’s Office of the President and is administrated by the Office of the Chief Operating Officer and the Office of the Dean of the School of Continuing Studies.